After graduating college, Matt packed his things and moved to South Korea where he found a job teaching English. There he discovered Korea’s national dish, kimchi. It was spicy, flavorful and could be eaten with anything and everything; meat, eggs, sandwiches, rice, veggies. When he found out its health benefits, he was hooked! After coming back to the US, Matt went to store after store in search of a kimchi comparable to what he ate in Korea. Unable to find anything, he decided to make it himself. Matt intently studied the process of making kimchi and learned how to properly ferment it. Not only did he make a kimchi that was equally (or better than!) the kimchi he had in Korea, but he was also putting his own creative spin on it. He began giving it to his friends, family, and coworkers and they loved it! Thus, Matt's Kimchi was born. 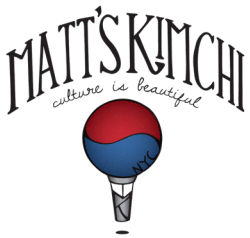 Matt's Kimchi is 100% raw, lacto-fermented, all-natural, gluten-free, and vegan.